In 1834, the General Assembly of the Church of Scotland passed the Veto Act, removing the absolute right of landowners to appoint ministers to their parish. The Act gave male heads of families who were communicants with the parish the right to veto the appointment of a new minister if a majority of them objected. To this end, the Assembly instructed kirk sessions to draw up rolls of the male heads of families in each parish. The Old Scottish Genealogy and Family History has transcribed the surviving rolls, and publish them on their web site. They are significant as they pre-date the earliest nominal census, which took place in 1841. 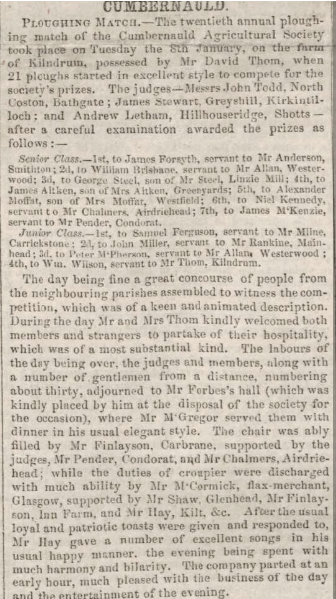 See the Old Scottish Genealogy web site for a list of Cumbernauld male heads of families in 1835 and 1839 Not only does it list heads of families, but where they lived and their occupation. It was a busy place in the early to mid-1800s. CUMBERNAULD, (from cumar ‘n ald, ” a meeting of streams,”) a parish in the eastern limit of Dunbartonshire, of seven miles in length, by four in breadth; having Kilsyth on the north, Falkirk on the east, New Monkland on the south, and Kirkintilloch on the west. The surface is diversified with hill and dale, is nearly all under cultivation, and well enclosed. Coal, lime, and freestone abound. It is watered on the north by the Kelvin river, and is intersected by the Forth and Clyde canal, near the line of which the vestiges of the wall of Antoninus are still extant. The village of Cumbernauld lies thirteen miles east of Glasgow, nine west of Falkirk, and thirteen south of Stirling, on the new road betwixt Glasgow and Edinburgh. It is chiefly inhabited by weavers. Its situation is beautiful, being nearly surrounded by the pleasure-grounds and plantations of Cumbernauld House. Prior to 1659 the parish of Cumbernauld formed part of the old parish of Lenzie, which was then partitioned into this and the parish of Kirkintilloch. 1848 – The Caledonian Railway laid their line from Gartsherrie (on the former Garnkirk and Glasgow Railway) to Greenhill on the Scottish Central Railway. Other than the farms, there were no buildings around the station and in the early days it was referred to as Carbrane Station. There are no buildings shown in the area on a map published in 1864. The line gave the Caledonian access to central & north eastern Scotland from Glasgow and its main line from Carlisle, but the station at Cumbernauld wasn’t a commercial success as the village it served wasn’t particularly large and so it closed after just one year of operation. Cumbernauld Station eventually reopened in 1870 to be served by local passenger services from Glasgow Buchanan Street on the lines toward Falkirk & Stirling. On 21st June 1873 the Falkirk Herald reported a meeting where the growth of traffic at the Station was noted and proposals were made for a new line extension to Cumbernauld Village with a new station adjacent to the Spur Inn, but the idea was never taken forward. The coming of the railway was fundamental to the development and growth of the Fireclay Works which led to employment and new housing around the station and in Greenfaulds. See Wikipedia for more. A search through the newspapers in the 1880s reveals a remarkable amount of community activity revolving around the churches and the farms. There were regular farm sales of crops and livestock. There were school trips to the farms and in 1897 Mr Muirhead, Kildrum Farm, granted a field for the occasion of Queen Victoria’s Diamond Jubilee and the Camelon Band was engaged for the day. Last but not least, there were annual ploughing competitions often with 30 ploughs on the field – and this would be with horses. All the local farms took part with prizes being awarded for the best in a range of categories. Celebrations continued into the evenings with dinners hosted by a local farmer with the usual good cheer and merriment. 1880s – It was during the years leading up the end of the 19th century that many of the large stone buildings around the Station were constructed – Station Buildings, much of Greenfaulds, Forrest Place, Masonic Place, Millview, Norwood and Cortachy, Glen View, Southern District Hall, the Post Office and of course Southern District School – and I still remember the date shown in the apex of the roof – 1886.